I was turned onto this book by a dear friend who happens to be a psychologist. Our conversation that night was around why people do what they do. I was fresh off some training with some Franklin Covey guys where they used an illustration (Fig. 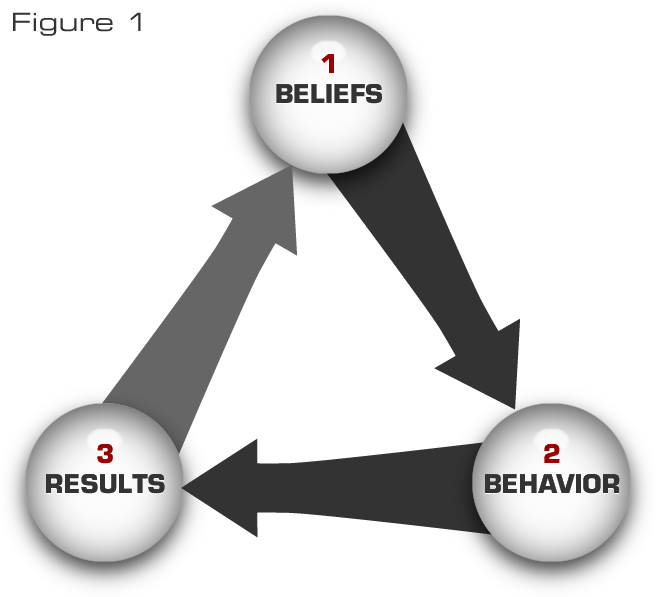 1) that shows our behaviors are shaped by our beliefs and those behaviors produces results that either reinforce or challenge our beliefs. The point is that if you want to see change in your life, just changing what you “do” won’t produce any sustainable results unless we also change what we believe. That’s when my friend said I should read Gary Smalley’s book, Change your Heart, Change your Life. He went on to tell me that it was a book about just what the Franklin Covey guys illustrated and was, in part, a personal testimony of this life-change technique in Smalley’s life. So, I picked up the eBook for my iPhone and started reading it, but I didn’t read it alone. I invited a friend to read it with me (HINT: accountability technique was just disclosed). In the very first chapter, I was hooked. If the rest of the book delivered on just half of what Smalley claimed to do, I would be a better man for it. In essence, the book walks you through how to both identify the beliefs that shape negative behavior and how to replace them with Scriptural Truth and in essence transform your life into one that is described as “abundant” by Jesus. In just a few short weeks, I was indeed thinking and believing things differently as was my reading buddy. We both saw how those new beliefs had an internal and external impact on our lives. I highly recommend this great little book that can help unlock the potential for the life God desires for us all. In fact, I’ll go so far as to say that this book contains the techniques and principles needed to kick that nagging behavior that is stealing life from you over and over. It is a must for men and certainly won’t be a waste of time for women. Thanks for the tip. I just downloaded the ebook to my iPad.